What deer hunter wouldn't be happy with a California mule deer buck like this one! 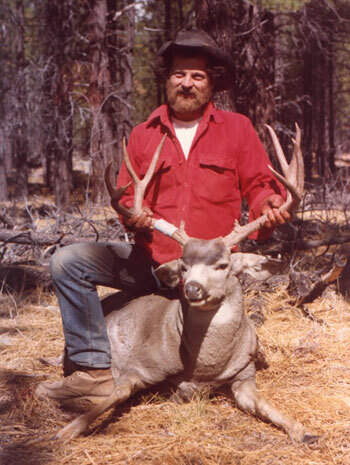 This buck was taken by Rich Landis of Sacramento, California in the mid-1970s in what is now the X6b deer zone. The four-point buck had a spread of 29 inches and provided Rich with 158 pounds of vension from the butcher shop. Rich was hunting on the opening weekend of deer season and took the buck with one shot as it attempted to sneak away from Rich's hunting buddies who were particapting in a drive with him. That weekend, 13 bucks were taken off the ridge and adjacent areas. Photograph and information submitted by Douglas Lindsey.